The Miras platforms feature a rugged construction and overload protection for industrial applications. The following built-in applications can be conveniently selected at the simple touch of a key: counting, checkweighing, mass unit conversion and toggling between gross | net values. The scales can be operated using an AC or a DC power source. 15 kg/33 lbs. 300 kg/660 lbs. ± 2.0 g/0.005 lbs. ± 40.0 g/0.1 lbs. ± 4.0 g/0.01 lbs. ± 100.0 g/0.2 lbs. Minebea Intec Miras is a unique Multi-functional line of industrial bench and floor scales. Builtin overload & wash-down protection, portability (with optional castor wheels), and easy to use functionality make this affordable line of scales a winning combination. 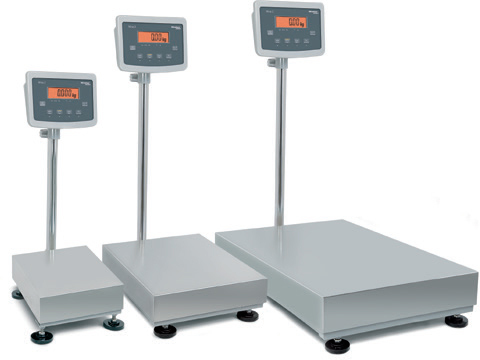 Weighing capacities range from 6 kg (13.2 lbs) to 300 kg (660 lbs) in three different platform sizes. Miras platforms are equipped with painted steel frames and removable stainless steel weighing pans for years of dependable service and easy cleaning. Stainless steel column (tube) is standard with all models and is easily removable. Indicator can be set on a bench or adapted with our optional wall bracket for easy mounting. Easy set-up and installation allow you to get started quickly and efficiently. Attach the column and plug your scale in and you are ready to weigh – minimal warm-up time is needed. Large “On|Off”, “Tare” & “Zero” keys make for convenient and easy use. Selectable numeric lower and upper limits provide easy and convenient set-up. Display shows HI|OK|LO for easy operator reference. Select fixed reference sample (5, 10, 20, 50, 100) from menu. Place exact number of parts to be counted onto the scale and press enter. Then place the remainder of your parts to be counted; the total number of pieces is shown on the display instantly. 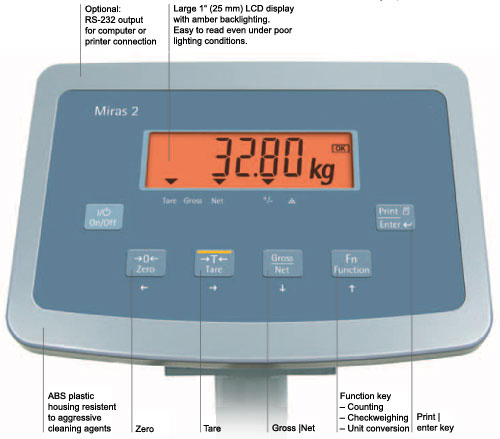 With Miras indicators, users can deduct and store the weight by pressing the tare button repeatedly, up to the scale’s capacity, and can then toggle between gross and net weight. This function is ideal for weighing multiple ingredients for formulation purposes. Place a container on the platform and press the tare key. The tare is automatically stored in memory and the net weight is displayed. The user can easily toggle the display between gross and net weight by pressing the Gross |Net key.